The celebration of the opening of the Erie Canal in 1825 included a ceremony called “Wedding of the Waters”. A barrel of water collected from Lake Erie was transported 363 miles via canal boat to the mouth of the Hudson River where DeWitt Clinton poured it into the Atlantic to signify that the Great Lakes were now connected to the Atlantic Ocean, thanks to the new canal. On the 2014 Cycling the Erie Canal bike ride, my friend and fellow rider, Kathy Hudson, joined me in reenacting this ceremony. It all started several years ago when I had a conversation with an acquaintance who was a lawyer by profession in Palatine, NY, an Erie Canal town. I spoke to him of my interest in the canal which grew with each trip past the Champlain Canal from my home near Burlington, VT, and by seeing the remnant of the original Erie Canal along I-90 near Port Byron. He had handled several cases dealing with property rights along the canal. He knew a lot about the historic man made waterway and recommended two books: Wedding of the Waters by Peter L. Bernstein, and The Artificial River by Carol Sheriff. Bernstein’s book fueled my interest in the canal and prompted me to visit several sites along the canals: Champlain Canal Lock 11 in Fort Ann, the Erie Canal locks in Waterford, Cohoes Falls, the Syracuse Canal Museum and the Lockport Flight of Five. Each of these sights fascinated me and I wished I could someday travel on the canal to experience it from end to end. 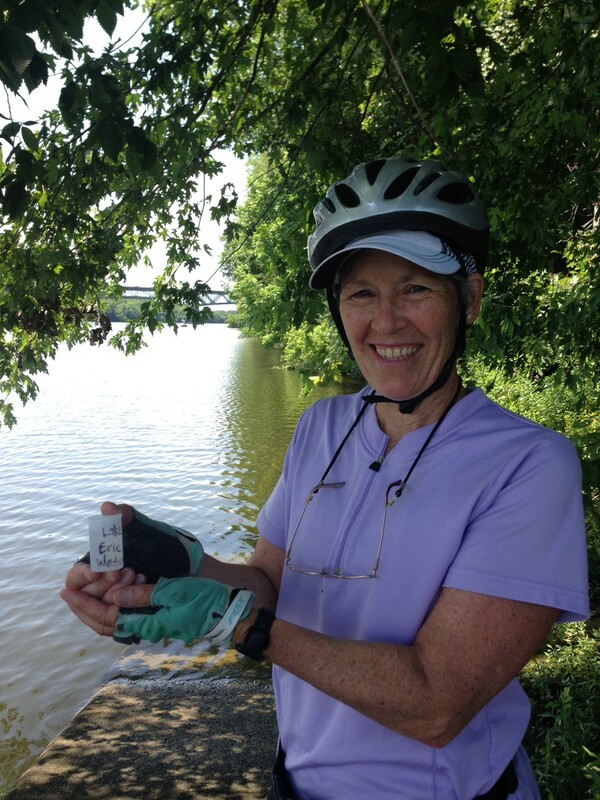 Enter my best friend, Kathy, who invited me to join her on the Cycling the Erie Canal bike ride this summer. She learned about it a couple of years before when she was in Albany and just happened upon the finish of the bike tour. I was a casual cyclist and the thought of 400 miles of biking in 8 days was daunting, but I had time to train for it so I decided to sign up. I had never been on a bike tour, nor ridden more than a few 25-mile rides in the past 20 years, but the prospect of cycling along the towpath (mostly) all the way from the beginning to the end of the Erie Canal seemed a great opportunity to get to really know this historic canal. 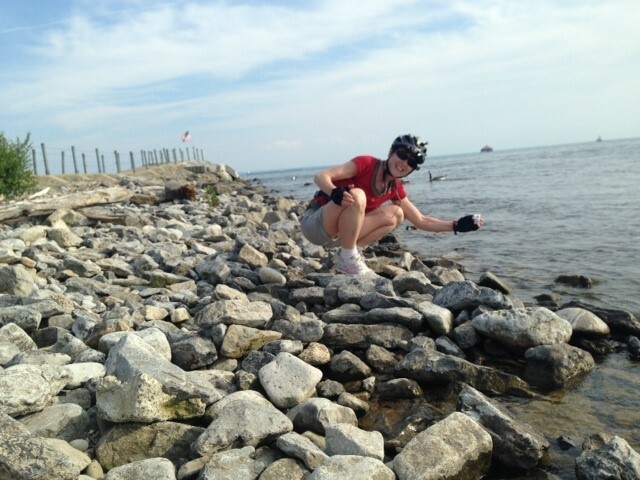 As the tour date approached, I was inspired to make my own connection with Erie Canal by carrying a container of water from Lake Erie to the Hudson River. 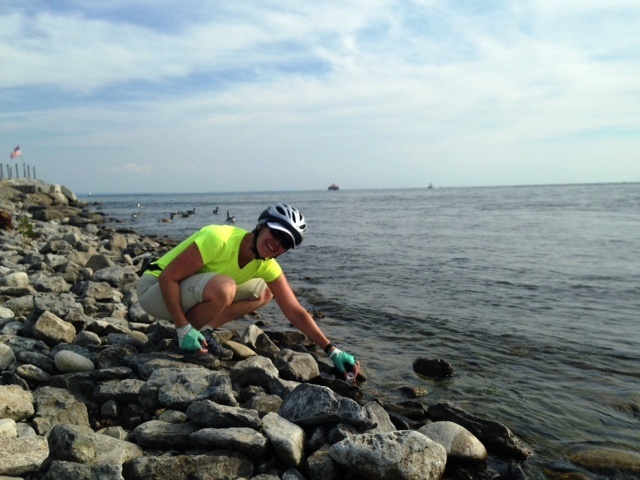 I brought along a film canister and the evening before the ride, Kathy and I rode through Buffalo to Lake Erie where the Niagara River begins. We each dipped the small container into the water, sealed it, then packed it into my bike bag for the long ride to Albany. We checked it from time to time, encased in a ziplock bag, with growing anticipation of the day we’d reach the Hudson. On Sunday, July 2, after 8 long days of riding, we came upon an old landing inside the city limits of Albany. 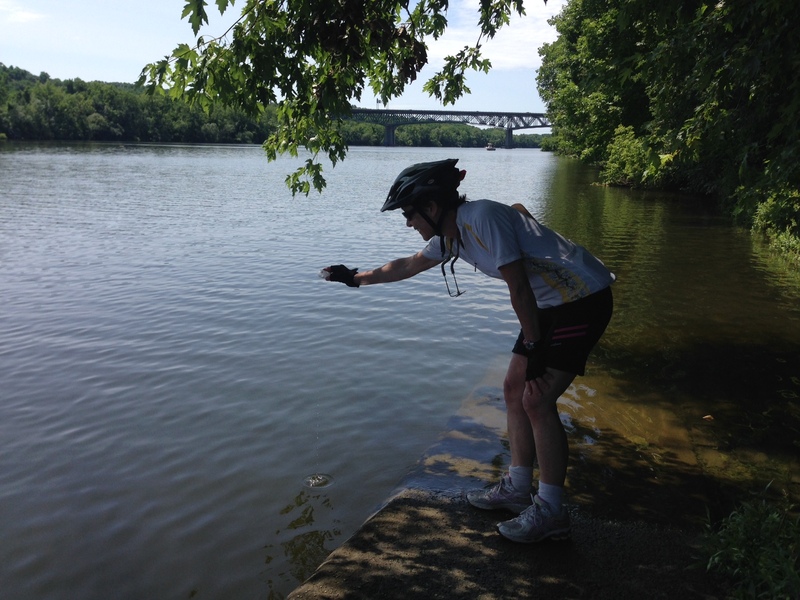 There we stopped our bikes, removed the vial of water, and each poured part of it into the river that would take it on to the Atlantic. It was a thrill and put the final touch on a terrific tour that I will always remember for the fun, the friendly people on the ride and in the town, and the sense of continuity I now have of the Erie Canal from Albany to Buffalo.